I grew up in a time before GPS. I learned how to use a compass in Cub Scouts and learned how to navigate with one as I grew older. I think I got my first GPS system sometime in my late 20s and never really used it for much beyond tracking my route, I still always preferred a map and compass. Knowing how to use a compass is one of those things that seem unnecessary and archaic until you find yourself in a situation where your life depends on it. 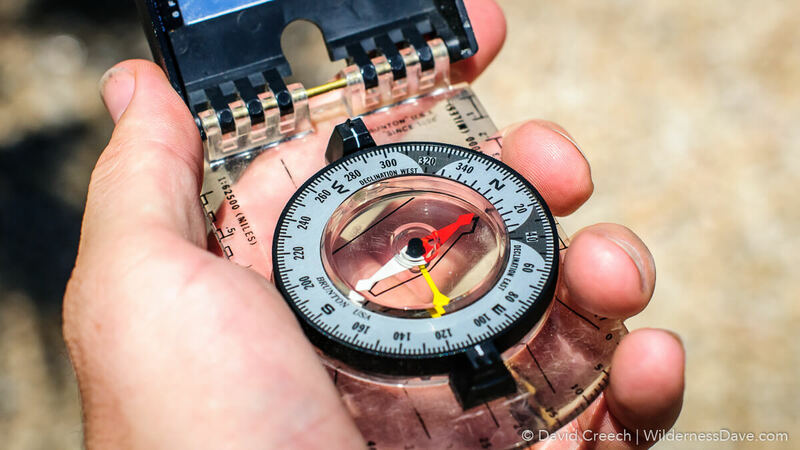 Knowing some compass basics should be a part of everyone’s skill set if you spend any amount of time outdoors, on the trail, on backroads or anyplace where accurate use of a map can mean the difference between making it home and not making it home. A recent article pointed out that most people are “too reliant on technology, expecting smartphones and satellite navigation systems to do the hard work for us” when it comes to map reading and navigation. It’s true that we rely too heavily on technology. This can be exceptionally dangerous when we put ourselves in risky situations. What happens when that technology doesn’t work? Batteries die? Signal is lost? Right. So go grab your dad’s old compass, dust that thing off and let’s start developing some of those life skills you’ve been hearing so much about. 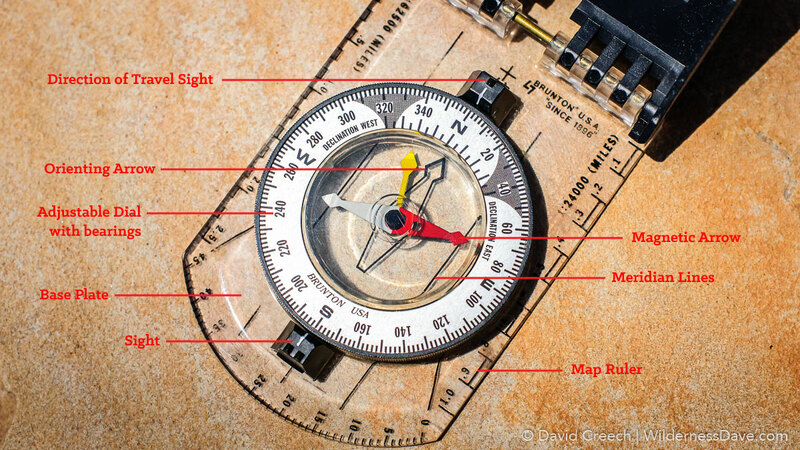 Before you try using your compass in the field, it’s a good idea to familiarize yourself with it’s basic anatomy. Read through the instruction book that came with it and identify it’s components. There are a lot of different compass designs out there with different ways to adjust and read them. This old Brunton Elite of my Dad’s is a pretty basic model to learn with. You remember basic geometry, right? A full circle is represented by 360 degrees (with Zero and 360 being the same point). The four cardinal directions (North, South, East and West) are located exactly 90 degrees from each other (360 degrees divided by 4) and are read clockwise from North (North is always Zero/360). 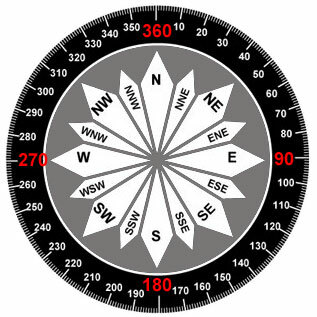 So when reading a compass we universally recognize North as Zero, East as 90 degrees, South as 180 degrees and West as 270 degrees. Remembering to read clockwise from Zero is probably the most important part of reading a compass (otherwise you’ll end up heading the wrong direction). From there, further refinement is pretty easy. General directional headings are usually given using a set of 8 (45 degree increment) or sometimes 16 (22.5 degree increment) standard directions. How does this work? If we are told to follow a Northeast heading we are looking for an angle halfway between North (0 degrees) and East (90 degrees) which would be 45 degrees. So what would a Southwest bearing be? Halfway between South (180 degrees) and West (270 degrees) we would have 225 degrees. Easy enough, right? Breaking our directions down even further we can provide more accurate headings. Dividing 45 degrees in half we end up 22.5 degree increments and a set of 16 standard directions. Given a bearing of East-Southeast we would look for the point between due-East (90 degrees) and Southeast (135 degrees) which would be 112.5 degrees on the compass. Now that we understanding the traditional directions and how they relate to each other (in degrees) we can start navigating. Navigation is all about getting from point A to point B. Accuracy is important otherwise you will just be getting from point A to somewhere-kinda-near-point B. Taking and following a bearing is a key component of using a compass for navigation. So what is a bearing? A bearing is the directional heading between two points, measured in degrees and using North (0 degrees) as a reference. To take a bearing, hold the compass in front of you with the direction of travel arrow pointing at the object of interest. Hold the compass level and steady, and rotate the housing dial, until the orienting arrow lines up with the red end (north end) of the magnetic needle, all the while keeping the direction of travel arrow pointed at the object. Read the number indicated at the index line, and that is your bearing. Finding a bearing using a map is not terribly difficult either. First, identify your current location on the map, this will give you your point A. Next, identify your destination on the map (point B). Assuming your path is a straight line between these two points you can line up the edge of your compass so that it passes through each point on the map. Turn the housing dial until the arrow points the same direction as North on the map. Read the number aligned with the directional arrow, that is your bearing. In the example below, I want to get from Columbine Campground (point A) to Webb Peak (point B). I line up the edge of my dad’s old compass with the two points and then turn the orienting arrow until it lines up with the map’s North. This gives me a bearing of 290 degrees (just shy of West-Northwest). See below for adjusting for declination. Following that bearing becomes relatively easy. Set your compass to the bearing of your heading, then, holding the compass level, turn your whole body with the compass until the magnetic needle lines up with the small orienting arrow. Now walk straight forward keeping the arrows aligned and you are following a set bearing. As long as you keep the dial set to your correct bearing and the magnetic needle aligned with the orienting needle, you should travel in a straight line to your destination. But how often can you really travel in a straight line? It’s much easier to follow a bearing if you don’t have to keep looking down at the compass and no one walks holding the compass out in front of them as they travel. The easiest thing to do is to identify a landmark along the direction of your heading and walk toward that. Using visual landmarks along your path you can easily travel along a bearing for great distances only having to check your bearing on the compass once you reach each landmark. If visibility is good, you can also take note of a landmark behind you to help insure that you are traveling in a straight line. Using both the forward and rear landmarks you can double check yourself regularly to make sure you haven’t wandered off course. It may also be useful to draw a crude map noting landmarks and bearings as you go, it will help you keep track of your path even if you don’t have a map to reference. Magnetic declination is where a lot of people start to get confused about navigating by compass. Declination is only important when using a map to get your bearings. There is a difference between Magnetic North (where your compass wants to point) and True North (geographical north used on most maps). 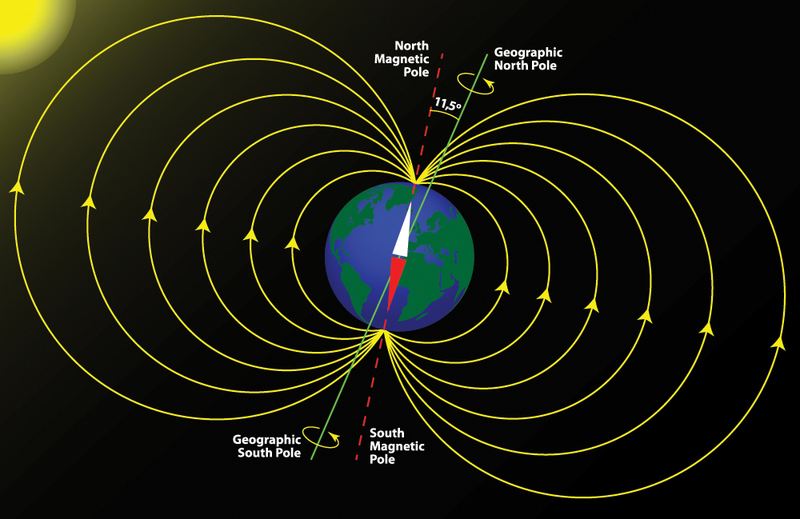 The difference between magnetic north and geographical north is measured in degrees of correction and is referred to as Magnetic Declination. There are places where the two norths are the same, these places fall on the so-called Agonic Line. In areas to the left of the agonic line the magnetic compass needle points a certain number of degrees to the east of true north, and on the other side of the line the magnetic needle points a certain number of degrees to the west of true north (in other words the magnetic needle points toward the agonic line). 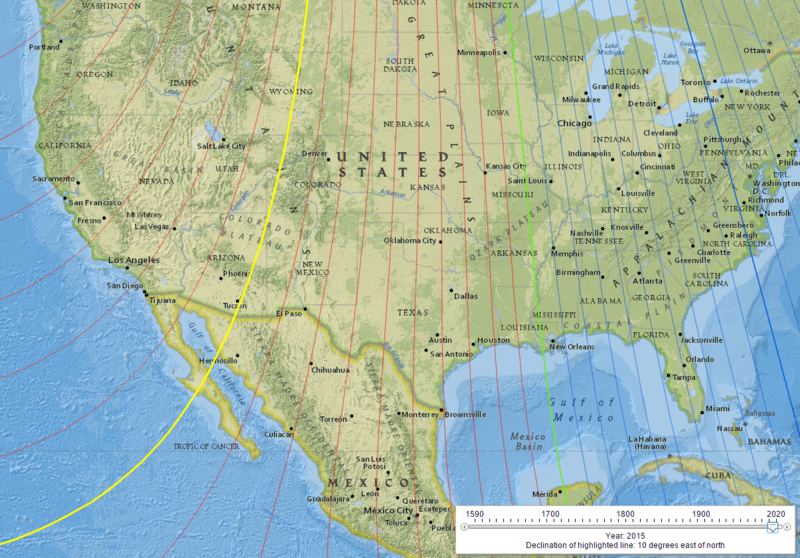 We say areas to the left of the line have east declination and those to the right have west declination. It’s important to know which side of the line you’re on. Depending on where in the world you and your compass are determines your declination adjustment. If you use maps often, it’s a good idea to know the declination in your area. Since the Earth’s magnetic field is not constant, declination is not a constant either. Many maps will tell you what the declination is for that area (bottom center of all USGS maps), but older maps could have outdated information. In the US between 2005 and 2015 the Agonic Line (0 declination) has moved from east of New Orleans to West of New Orleans. In 1975, the year I was born, New Orleans was at 4 degrees east. Unless you’re using 20+ year old maps, the information should be “close enough” to get by for backcountry navigation. The good news is that you don’t have to know anything about declination to adjust for it, you just need to do some simple math. Here in Arizona I know that the eastern part of the state currently has a 10 degree declination and the western part has an 11 degree declination. I also know that I am west of the Agonic Line so I am adjusting to the east. So as long as I know where I am in the state, I can figure out how to adjust my map bearing for magnetic north. 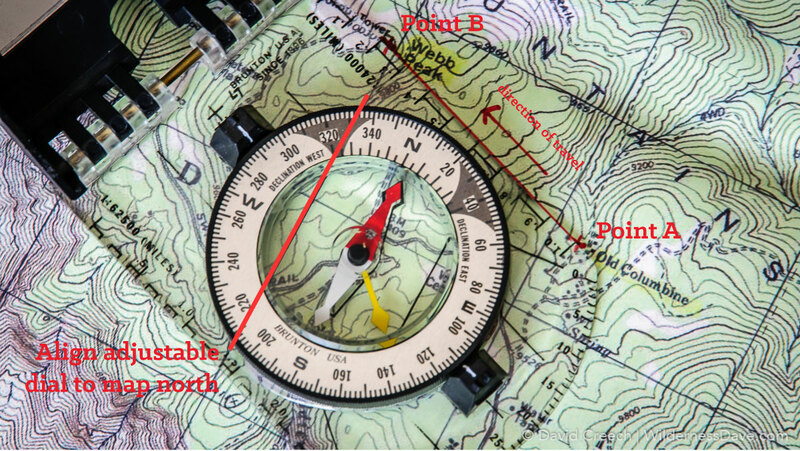 Using the example from above, if I wanted to get a true magnetic bearing on Webb Peak I would have to adjust my compass bearing 10 degrees to the east making my revised bearing 280 degrees (east declination subtract, west declination add). Most compasses you will use for navigating in the backcountry can adjust for declination on the compass itself, allowing you to offset the declination and use the compass without having to do the math in your head for declination. Just make sure it is set properly or you’ll be off in all your bearings. We know magnetic needles are affected by the horizontal direction of the Earth’s magnetic field, that’s how we are able to reliably use them for navigation. Knowing this, you might not be surprised to learn that they are also affected by the vertical pull as well. The closer you get to the magnetic north pole, the more the north-seeking end of the needle is pulled downward. Whereas, at the south magnetic pole the north-seeking end of the needle is deflected upward. Only at the equator is the needle unaffected by vertical magnetic forces. To overcome magnetic dip manufacturers must design compasses that have the needle balanced for the geographic area in which they will be used. A compass built for use in North America, will not work in South America. The North American compass will have the pivot point the needle rests on slightly into the north half of the needle thus offsetting the downward pull. When the compass is taken to South America, the imbalance will work in the same direction as the vertical pull and the needle could very well rub against the roof of the housing making the compass unusable. In other words you will need a compass manufactured for use in the part of the world you intend to use it. As a result of these magnetic variances, the compass industry has divided the earth into various zones. Make sure your compass is compatible with your area or look for a global compass that can be used internationally. Some compasses will also be outfitted with a Clinometer. The Clinometer is a simple mechanism for measuring angles and slopes. Using a compass clinometer requires sighting the point you’re measuring down the length of the compass housing which means you can’t read the face while your taking your measurement. You will need a mirror (built into some compasses) or another person to actually see the clinometer reading. The clinometer will tell you the vertical angle, measured in degrees, from your eye to a given target. How is this useful? Well, aside from letting you know how punishing that trail up the mountain might be it can also allow us to measure height or elevation if we also know the distance to the object. It’s handy, but unless you are a surveyor you will probably never really need to use this. Magnetic compasses are influenced by any magnetic fields, not just Earth’s. Local environments may contain magnetic mineral deposits and artificial sources such as MRIs, large iron or steel bodies, electrical engines or strong permanent magnets. Any electrically conductive body produces its own magnetic field when it is carrying an electric current and can easily exceed the Earth’s comparatively weak magnetic force. Keep your compass away from all metal objects since these can result in false readings by deflecting the magnetic needle. Common objects to avoid include wristwatches, keys, tables with metal legs or steel screws, mobile telephones and even heavy framed eyeglasses. Many geological formations, and for that matter, many rocks, are magnetized and can affect compass readings, as can electricity power lines. Best advice is to check and double check often. Learn to recognize the potential influences and avoid taking bearings when near them (rock outcroppings, vehicles, power lines, etc). Don’t store your compass near computers or speakers at home, keep it away from your phone when traveling with. When using it in the field, be sure you’re clear of any metal or electronics you might be wearing when taking a reading and hold the compass in your hand, don’t set it on large rocks, tables, car hoods or other flat areas you might be using to read your map. There’s really no substitute for practice in building your navigation skills and compass basics. Get out to your favorite park or wilderness area with a good map and do some basic orienteering. Follow one of your favorite trails and take bearings at each turn in the trail, find a landmark and see if you can reach it only using a compass bearing, whatever you do have fun with it and practice. Great post, Dave! Using a compass and map to navigate is one of the skills I first learned in scouting. When we were preparing to hike the John Muir Trail, we took a (free!) refresher course at our local REI. Here in SoCal, both REI and the local Sierra Club chapters have course where you can get field experience learning to use a map and compass. If you’re traveling in the wilderness, these are essential skills. Very true. You can usually find a place to take a class and practice the basics with some instruction. Maybe I’ll try to include a short list of places that offer instruction on the next post. I was considered a subject matter expert in land navigation while in the army. I used GPS a lot while elk hunting when I lived in Wyoming. I knew my GPS was pointing and leading me away from my destination (back to camp) one time, but just to see what it would do I continued to follow the arrow on the screen for almost a half hour before it flipped around in the correct direction. I just can’t fully trust them even thought they are supposedly better now. Another technology item is the “spot” device. On a recent trek in the grand canyon one of my fellow hikers would activate the spot at our campsites each night to let loved ones know we were OK. Only one out of four would get the email and often they would receive the spot message a day or two after we had moved on to a new location. So, it’s good to know how to use a compass and a map. Back up your back up, right? GPS is handy and nice, but not foolproof or absolute. You still need to have an understanding of your surroundings and where you are (supposed) to be headed. Otherwise it’s a blind man’s game. I’ve used my GPS a lot for tracking routes and I’ve come home to find those routes significantly OFF from what I actually traveled. That alone makes me very unlikely to RELY on GPS for navigation. It’s just another tool in the toolbox but can’t be the ONLY one you know how to use.